If there are people in your workplace that are experiencing unproductive working relationships caused by unresolved conflict, and you are you are looking for a mediator in Melbourne to facilitate some workplace mediation – then we can help. In the case of no agreement being reached on how to resolve the contentious issues, then at least the parties might reflect upon how further damage to the relationship can be minimised in future. In entering the mediation process, if there is going to be any reasonable chance of improving the situation, the following are some pre-requisites that the parties need to carefully consider. Neither party to a dispute should enter the mediation process lightly. From my experience facilitating mediation processes through Performance Development, I would offer the following principles as suggestions …. There must be a willingness from each person to honestly consider what they may be doing that is contributing to problems that are perceived to exist in the working relationship, and be willing to accept their portion of responsibility for contributing to finding solutions that are mutually acceptable. There must be a genuine willingness to give consideration to the other person’s view of the problems. 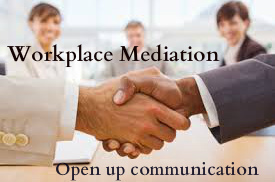 There must be an acceptance of the confidentiality of discussions during the day – that is, proceedings or comments from the process should not be disclosed to work-mates outside of the mediation process, without the mutual consent of the actual participants. Finally, the parties need to accept a no-blame exit opportunity for either of the individuals during the course of the process. In other words, either of the parties can choose to withdraw from the process at any time. The obvious risk, and disincentive to such a decision to withdraw, is that the issues causing the conflict will remain unresolved. Given that the cost of a half-day mediation process can be around $1,500 – it is important that the above principles are accepted by both parties before mediation actually proceeds. However the cost of mediation must be weighed against the cost of the dispute to the business. The role of the mediator is to offer no judgement on the issues, but simply attempt to promote a clear and open exchange of views – attempting to help each of the parties crystallize their feelings and concerns and to perhaps consider things from a different perspective. It is important for both parties to accept that the role of the mediator in no way involves apportioning blame, but instead is about encouraging constructive dialogue between the parties, so as to find a way to move the situation forward.